Great country location just south of Ponce de Leon on Co. Hwy 181-C. This is more than the usual manufactured home. The interior walls have been finished off with tongue-and-groove light pine wood. It has that ''cabin'' feeling. 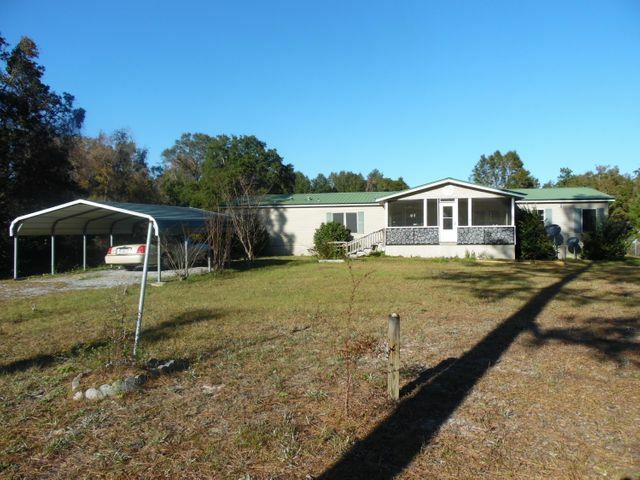 So spacious with 4 bedrooms and 3 bathrooms, on 1.35 acres, fenced yard, with multiple outside storage buildings. (above ground pool of no value). Central air and heat, with fireplace. Super Price for this 1976 square feet of living area and a total of 2600 under roof counting porches. Portable double car carport. Shown by appt. © 2019 Emerald Coast Association of REALTORS®, Inc. (ECARMLS). The information being provided is for consumers personal, non-commercial use and may not be used for any purpose other than to identify prospective properties consumers may be interested in purchasing. Information is believed to be accurate but is not guaranteed. Data last updated: Friday, April 19th, 2019 06:46:38 PM. Listing courtesy of Realty West.